But red-hot Seattle has first back-to-back declines since 2014! The new tax law will have a big impact on the housing market, the magnitude of which has not been fully appreciated just yet. Read… What Will the Tax Bill Do to the Housing Market? 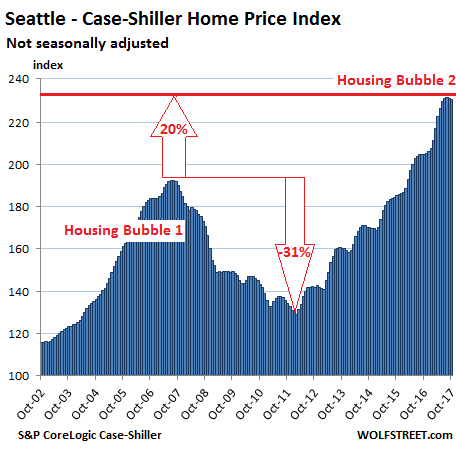 Just my guess, but if prices really do fall in Seattle, whether because of a change in the tax laws or a future recession, my prediction is it will be a rout because construction has increased even faster producing more places than I thought possible to ever find buyers and at prices that I thought couldn’t be sold. I’ve been wrong for years but if the day comes that I’m not, then I don’t think it will be a mild correction but a bloodbath. I agree with your assessment. Developers and flippers can’t work fast enough to satisfy the demand for housing in Seattle. The sorry state of our infrastructure and lack of mass transit ensures that as population growth continues, a homeowner will need to live very, very close to South Lake Union to avoid an absolutely hellish car commute. I don’t see prices in the central neighborhoods coming down. Even if prices ever do start to moderate, I see plenty of 20 somethings with good incomes who are currently living in micro apartments or with roommates jumping on the opportunity to finally get their own place. Everyone seems to want to move to Seattle but current residents have put in place a low growth policy meant to inflate home values. The only housing going up is expensive high rise condos, near downtown, built for affluent people. Anyone who is not wealthy or earning at least $300k should take the hint and move on. The place has become a big poo bucket, if the 5% want it then let them have it. What the U.S. desperately needs are slums for laborers to live, near big cities but out of view of the affluent, so as not to “inconvenience” them. Affluent people still need laborers, without them who will do landscaping, childcare, espresso preparation, restaurant staffing and etc.. These services can’t yet be performed by machines but we can’t have these people living among us in tents, I mean really. Seattle should buy up a dumpy area, like Tukwila maybe, and bulldoze everything to make room for slums and let workers settle in. All that is required is communal sewer and water every acre or so and the slum residents can build their own makeshift shelters. Provide bus service to and from the slum every morning and evening to transport the workers where they are needed in Seattle but make sure they disappear in the evening so everyone still feels safe. This is how other countries manage to maintain nice affluent areas without having the necessary laborers ruin it for everyone. Seattle will realize this necessity eventually and we will finally get our slum – now that’s progress! There is no low growth policy in Seattle or any of the suburbs.. 72 cranes in Seattle and more in outlying areas put that notion to rest. Actually this construction boom is area wide. I live north in Everett which has had and is still building lots of low-rise/high-rise apt. and condo projects to take the Seattle spillover. The eastside is booming with cranes everywhere… Southside is sopping up home buyers that can’t swing Seattle prices but all that’s done is drive up prices everywhere.. The entire length of the new light rail, which goes through what was once affordable neighborhoods, has been followed by expensive new condos and apts. 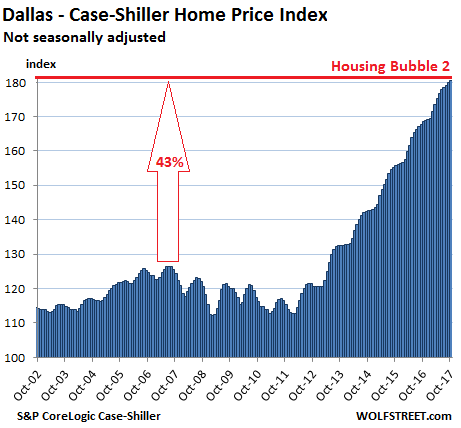 which has driven up the prices of single family homes that few locals can afford. The slum that you described is already here in tents that line the interstate that few bother to notice.. Most people step over the beggars that sleep on the sidewalks and in the alleys and I’m afraid it’s going to get much worse..
Seattle has a low growth policy. Those cranes are restricted to downtown. Areas adjacent to downtown (such as Capitol Hill) have height restrictions (four stories) and strict zoning hurdles (low growth measures being implemented). Seattle is a low density, suburban town. Wage earners cannot afford any of the ugly, decrepit, old, moldy, suburban shacks (in areas such as Ballard and Northgate) and they can’t afford the gleaming new downtown high rise condos. We need to set aside land for slum formation or else vital workers will have no space to live. The “jungle” along I-5 started a natural progression toward becoming a slum but it was snuffed out, by authorities, because it was too close to gentrification (Beacon Hill). Slums need to be kept a safe distance away from the affluent but close enough that workers can be brought in and out, to tend to the affluent, on a daily basis. The ugly area around the military bases (south of Tacoma) would be ideal but it’s just too far. In response to Seattle’s “low growth policy”..
“Uptown (or lower Queen Anne, depending on your name preference) is the latest Seattle neighborhood to experience a rezone for mandatory housing affordability (MHA). Like with other neighborhood rezones recommended by HALA, the measure would trade building height for affordable housing. Developers would have the option of either paying into a city fund or including the housing in the development. Most height increases are relatively small, although maximum building heights will more than double—from 40 feet to 85 feet—in a thin area just north of the Seattle Center. The biggest heights would be allowed in the southeast corner of the neighborhood near South Lake Union, where building height limits would go from 85 feet to up to 160 feet. Height restrictions were moved upwards, not down.. The US market seems to be the only market that hasn’t started the decline in a meaningful way. Canada, Australia, London, other European markets have started to show the sign of troubles to come. It’s as if the US is sheltered in a bubble. To be fair, Canada and Australia somehow avoided the last recessions. From what I saw in Canada last recession, the oil didn’t fall far enough to cripple the currency. The west funded the east with equalization payments – “welfare” and kept the train on the tracks. The oil isn’t strong enough to prop up this current bubble and it should have popped a year ago but interest is too low to stop the greed. Our Kool Aid is just awesome-er From stocks, bitcoin, and especially Ponzi schemes, we just do it better down here. Witness Tesla, which Wolf has written about many times. The product does not work. Heck there’s no product, the founder has been caught with her pants down defrauding people, but no problem, here’s more millions. 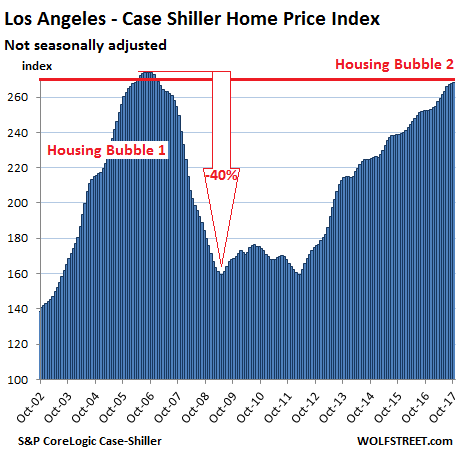 The US real estate market will follow the decline for certain; just a bit later than the others; after all Wall Street is the inventor of all frauds. Compared to Crypto currencies, all makers seem rational. The big difference in today’s US housing market compared to the previous peak is there are large disparities in submarkets for most MSA’s. In my submarket in SW FL, prices are well beyond peaks reached in 2006. Less than a quarter mile away, prices are still 40% below the 2006 peaks. The reason is the majority of potential homebuyers do not have access to bank loans in 2017. In 2006, anyone with a pulse could take out a no money down mortgage. Shouldn’t the second bubble be significantly higher than the first bubble before it pops, like the stock market topped around 14K in 2007, is now nearly twice that. Not to throw cold water, but this bubble is small potatoes. a starter home in my area in a so so hood is $600K…and that is a POS crap shack. This bubble is much worse than small potatoes. If the equity market corrects, it may not have much effect on the economy, and by extension housing. and should that pullback be tied to a rate hike surge, housing might actually do pretty well, asset inflation in housing has lagged equities. the housing cost problematic is tied to technology, housing needs to benefit from technology more than it has, and that would bring prices of new homes down. House prices can only go as high as there are enough people with high enough wages. You can put any price on something but if populace can’t afford, it won’t sell. Downturn in any market affects others. Layoff, etc. 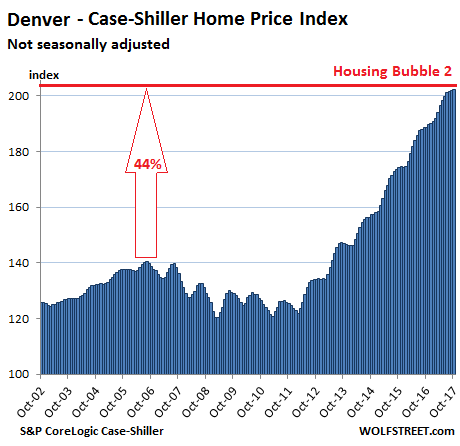 Housing bust on it’s way. 7 of the 9 cities on the list have bubbles that are already significantly higher: Boston, Seattle, Denver, Dallas-Ft. Worth, Portland, and the San Francisco Bay Area. Only 2 on the list are lagging: Atlanta is only slightly higher, and Los Angeles is still a tad below. 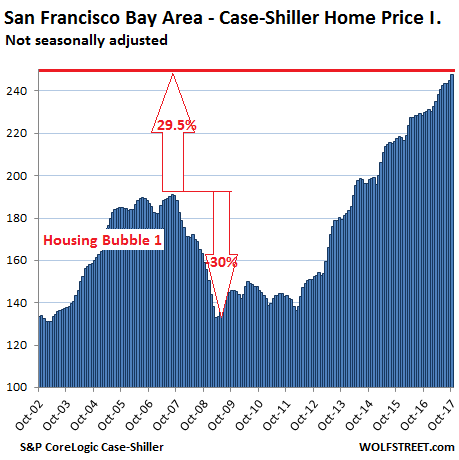 During Housing Bubble 1, the housing market went south in some markets as early as 2005 and as late as Nov 2007 (city of San Francisco, per median price). They do it on their own schedule. The national average just averages it all out. 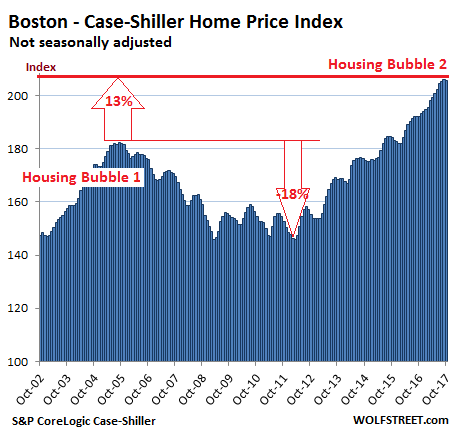 It’s only a bubble if it pops – if it never pops it’s just a very expensive asset. The cities listed are areas where affluent people choose to live and it looks like there will always be enough affluent people to keep these areas expensive. Some workers still manage to find cramped, moldy, basement units on busy streets that can be had for only 80% of their income – they have decided it’s worth the privilege of living among the elites. Question is how long can they afford the privilege – after all that basement might make a nice peid a terre for a neice or nephew when they visit (and the lowly wage earner must be lured to the slum). is this index adjusted for inflation ? No. 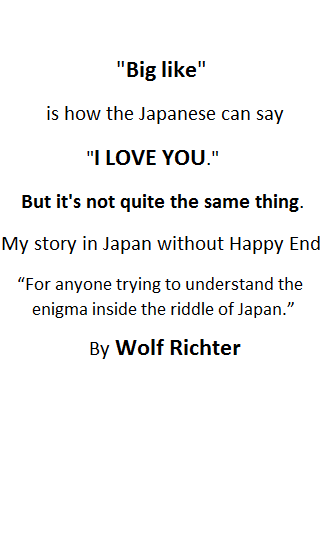 So you can strip it out. 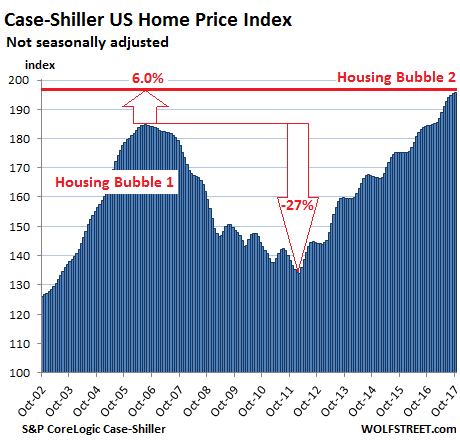 According to the Fed’s preferred inflation measure (core PCE), there has been 17.7% inflation since the totally insane peak of Housing Bubble 1. 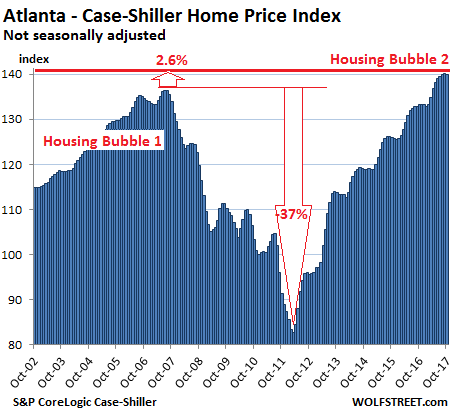 Deduct 17.7% from the CaseShiller indices, and you will see that several of the indices EXCEED the prior totally crazy bubble levels even after inflation, and that the rest are getting closer. Those peak levels were the ones that imploded with fanfare. They weren’t some normal state of calm. 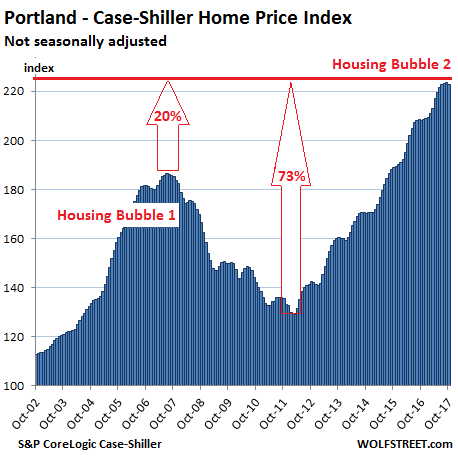 They were the very edge of Housing Bust 1. In my town there’s a thing called “Christmas In The Park” which is just the kind of thing you think is the coolest when you’re about 6. I think it set some kind of record for the most Xmas trees in one place this year – trees from this and that high school, that Elks lodge, etc. There are booths selling hats and various geegaws, but what really stands out to me, particularly since the caricature artists have given up and stopped coming, is the sign guy. He’s got a lunch-truck type truck and he makes those wooden signs with a router. “The Robinson Family” and so on. The kind of sign you put on the door of your house, or maybe on the fence out front. Somehow Christmas … and signs … are connected. He gets about $200 for a sign the size of two laptops side by side. Somehow he’s got a system that allows him to take orders for signs and have them done, the letters routed out with his router, the paint in the letters and on the edge, and the whole thing slathered with varnish and ready to take home in a few hours or the next day. I am very curious about this. But the thing is, why has this guy got a line longer than the one at the churro truck? Who’s buying all these signs? It’s got to be the same people who are buying flooring and carpeting and trim and porcelain … stuff … hand over fist. Exactly the kind of sales you get in a huge housing bubble. Fascinating anecdote…maybe the wood sign business is a key indicator of a housing bubble? Does anyone think this is normal Econ. 101 supply and demand? Has anything been normal since the GFC of ’09? It feels like ‘m living in a Salvador Dali painting or parallel universe or something. Sheesh. Three major bubbles in 20 odd years. I’m sure it will end well this time also. The marvels of financial engineering. Insanity knows no bounds. Free markets and sound money: Can we please have some of that for a change? An “everything bubble” is just inflation. “free markets and sound money” – I’m afraid those are things witnessed at the beginning of a monetary system, but we are in the crash and burn death phase of our system. We have stalled and begun to spin into an inflationary death spiral. Things will seem surreal and nostalgia for the way things once were will run rampant, but we chose our path and now we can’t go back. At least their are many anti-depressants and other drugs available to help you through the transition, watch a half hour of television and you might see adds for 10 or more – try them all! These must surely be the best of times. Increase spending on the military and spend huge sums on a wall (hopefully we can find enough Mexicans to build it) – mekin merica grate agin – indeed! That’s what cheap money will do. The FED has to know what they have created, they can’t be that stupid – evil yes!!! And, I think they are now scared sh*tless of the dire consequences that are only a matter of time. But, I’ve got to hand it to them on how long they have been able to keep this scam going…much longer that I ever could have imagined, especially given the lack of economic substance with food service “jobs” leading the way. So many people and companies are so cavalier about debt. Also, I think many in finance are ignoring balance sheets – I always check the balance sheet – I always look at a company’s balance sheet. In fact, I recently checked McDonald’s only to find assets of $31 billion vs liabilities of $33 billion, so they have a negative net worth and the share price is at the moon. Houston, we have a problem!!! They simply must hit that 2% inflation target – everything is just too dang inexpensive here in the U.S. – the beatings will continue until the morale improves. Gaudy mega-mansions for the .1% who are the sole beneficiaries of the Fed’s “No Billionaire Left Behind” monetary swindles, micro-houses for the proles! Welcome to the globalists’ incorporated neoliberal plantation. As to Marin County in the San Francisco Bay Area, it’s super desirable, but with little inventory for sale. However there are lots of apartments and homes now for rent in areas once inhabited by immigrants who have left for legal or economic reasons such as the 1950s era ranch style homes behind the Civic Center and around the Canal in San Rafael which is a light industrial area with lots of working class apartments, a canal, a boat harbor with lots of residents living on vessels and light surrounding light industry. It reminds me of South of Market in the 1980s around China Basin in San Francisco, shabby chic, with lots of industrial spaces waiting for one decent coffee house to open to make it the New Mission. Our favorite music venue is already there, Terrapin Crossroads, run by one of the Grateful Dead. The housing crash of 2007 was caused by sub prime mortgages. Money for almost anyone. The rates when up and up and then people started foreclosing. This is not happening in the current market. If there is a black swan, I have not clue as to what it could be ( aside from geopolitical events). Over time with deregulation, it could happen again I suppose. The housing crash of 2007 was not caused by sub prime mortgages, but by prime mortgages failing as a much larger percentage of sub prime. Sub Prime was just the tip of the iceberg.